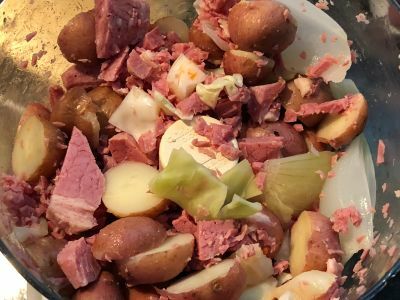 As soon as I start cooking Corned Beef and Cabbage I can't wait for an upcoming morning when i can make Corned Beef Hash. It is easy to make and is one of the heartiest breakfast dishes around. 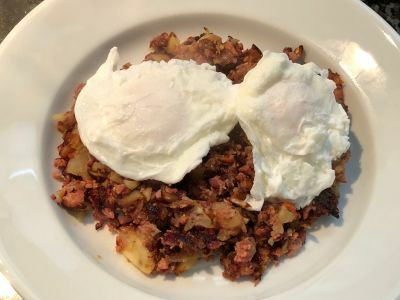 Serve it with a couple of poached eggs with the yolks soft and runny, and maybe even a little ketchup over the top and you have a sure fire winner. Enjoy! Note - If making this dairy free, omit the butter and just use olive or vegetable oil. Note - See our recipe for Poached Eggs and learn how to make them ahead of time to take all the stress out of making this for a crowd. 1. 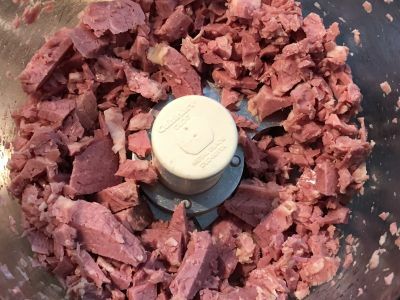 In the next steps we are going to chop the ingredients in a food processor. It is best to do this in two batches. So add 1/2 of each ingredient called for in each batch. 2. 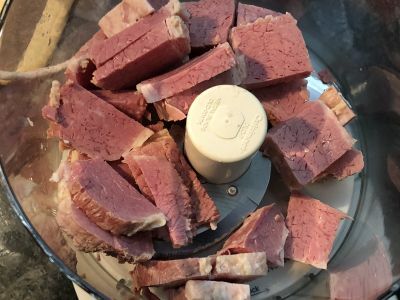 Add the corned beef to a food processor and pulse several times to get a coarse chop. You may have to mix it with a spoon after the first couple of spins depending on how much you put in the bowl. Do not over process this at any step. We are not trying to make a paste here, we want it to be chunky. 3. Add the vegetables to the processor and pulse several times. 4. 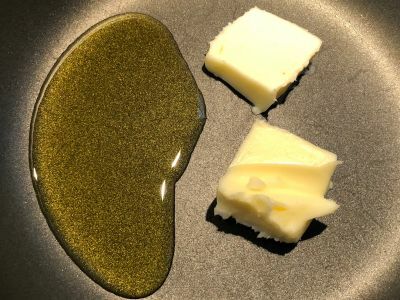 Heat the oil and/or butter in a fry pan until it is hot. 5. Add the hash mix and stir to coat with the oil and butter. 6. 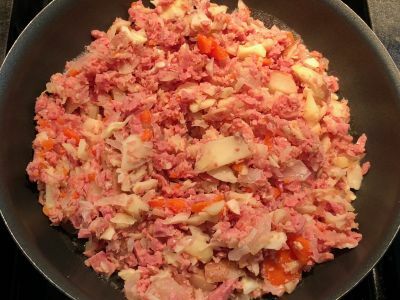 Cook over medium to medium high heat until the edges of the corned beef start to char. Turn it in sections several times during the cooking process with a spatula. Once it is well charred it is done. 1. See our recipe for Poached Eggs and learn how to make them ahead of time to take all the stress out of making this for a crowd. If you have done this right the hash should be done slightly before the eggs are done. 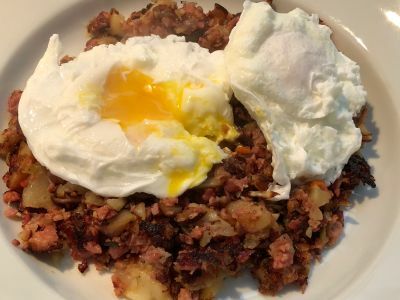 So you can serve the hash onto the plates and immediately remove the eggs with a slotted spoon and place on top of the hash. Serve with ketchup and a nice buttered English muffin or piece of homemade toast. 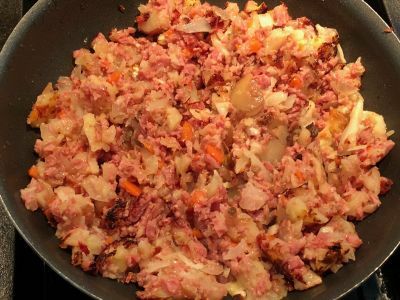 And let us know how you make corned beef hash so we can share in the fun. Enjoy! To improve the crust and add some moisture to the hash, toward the end of the cooking add 2-3 tablespoons of heavy cream. Mix the hash around a little bit so the cream gets down to the bottom of the hash and let it brown. If you want to serve it as a solid structure, invert it onto a plate from the frying pan. You can then cut it in pieces for serving. 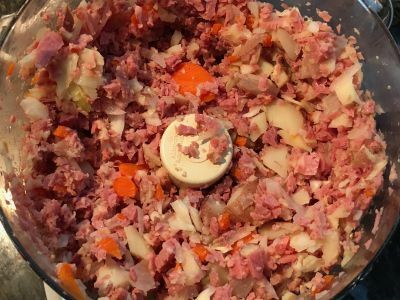 Some people also will add a beaten egg and a little bit of flour to the hash before cooking. 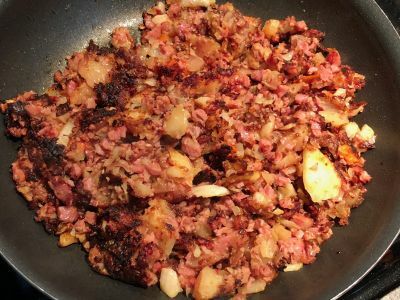 That will help to create the "pancake" style hash you sometimes get in diners so if you like it that way, give it a try. Figure 1 egg and 1 tablespoon of flour to 2-3 cups of hash. And as always, serve it with the eggs on top!